Perfect for fairs and trade-shows. Use your table to promote your business even further. 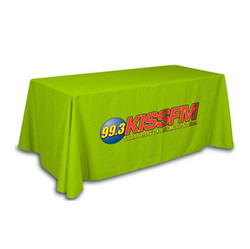 We have fitted covers and table throws you can customize. You can choose between 6ft& 8ft printed table covers. Request a Free visual mock up and see how your new table cover will look like!